A 1.7 mil polyester film coated with a high performance dry erase coating. It has a gloss finish and features a copolymer adhesive. 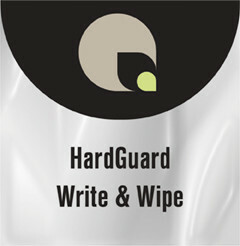 Unlike standard dry erase films that are oriented polypropylene, HardGuard Write N' Wipe is extremely resistant to "ghosting" by dry erase pens.